Kati Golenko, also known as Kati ‘La Polaca’ (the Polish) because of her Polish-American origin, was born in Chicago and started to play classic guitar when she was nine years old. However, the intense emotions transmitted through the rhythms and tones of flamenco fascinated her without a doubt. Since she felt in love a first sight with flamenco, her career changed and Kati started to follow this passion and her desire has been to understand and reinterpret the music she most admires and respects. In 2011 she started to study with Maestro Enrique Vargas and in 2015, she moved to Madrid to immerse herself in the large flamenco community that lives in the city. 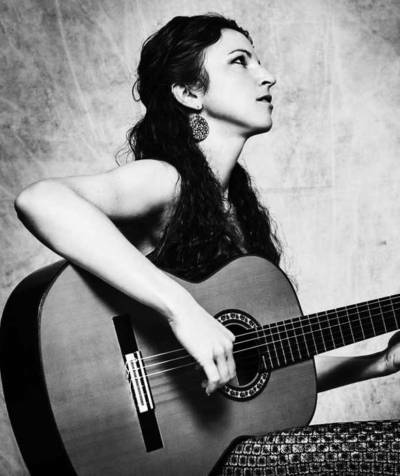 Since then, she has expanded her studies of flamenco guitar at the Fundación Casa Patas with José Jiménez ‘El Viejín’ and has deepened her singing and clapping skills with Montse Cortés and Miguel Reyes, respectively. Kati has worked in many places throughout Europe and the U.S. and, in the winter of 2017, a team of students from NYU, recorded a documentary about her life and experiences in Madrid. Miguel Reyes accompanies him, playing cajón drum. He is percussion professor at the renowned ‘Casa Patas’ and leads his own sextet that mixes Latin music, jazz and flamenco.